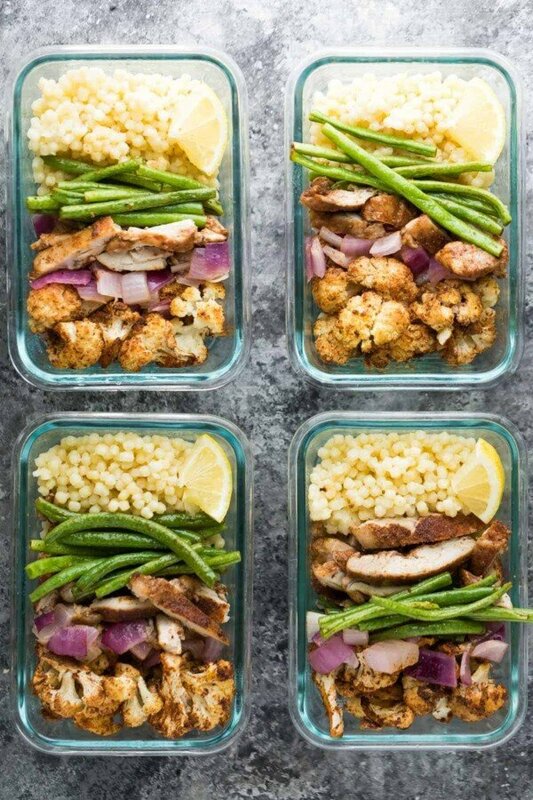 Moroccan couscous meal prep bowls with chicken thighs, roasted cauliflower, green beans and red onions. 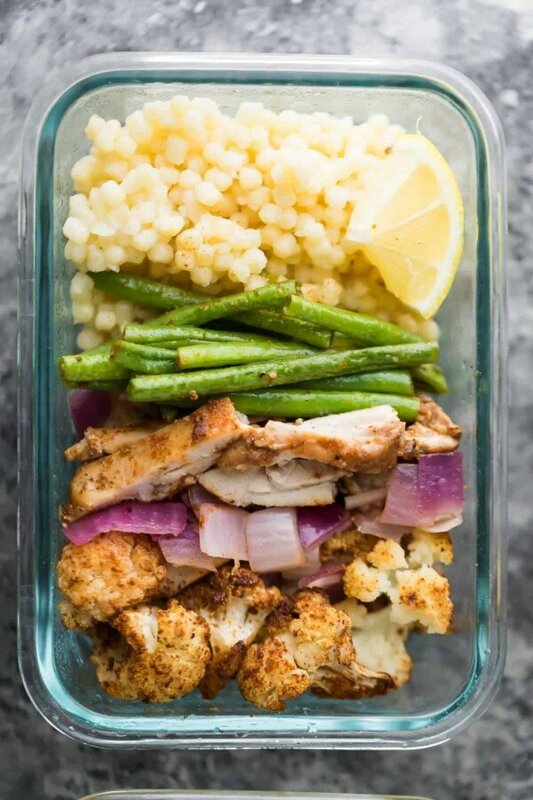 A delicious meal prep lunch recipe that also makes a great dinner! Ever since I made these 7 Easy Dry Rubs, we’ve been using them on everything! Grilled fish, chicken, veggies, potatoes, sweet potatoes, in quinoa, in vinaigrettes…you name it. One of my favorite things we’ve used the rubs on has got to be grilled cauliflower. I have this Easy Grilled Cauliflower With Jalapeno Lime Butter from waaay back in the day, but I think nothing could possibly beat today’s recipe, because Moroccan spice rub + roasted (or grilled) cauliflower is a match made in heaven. Roasted (or grilled) cauliflower gets kind of sweet and toasty and alllll sorts of delicious…if you haven’t tried it, give it a chance!! 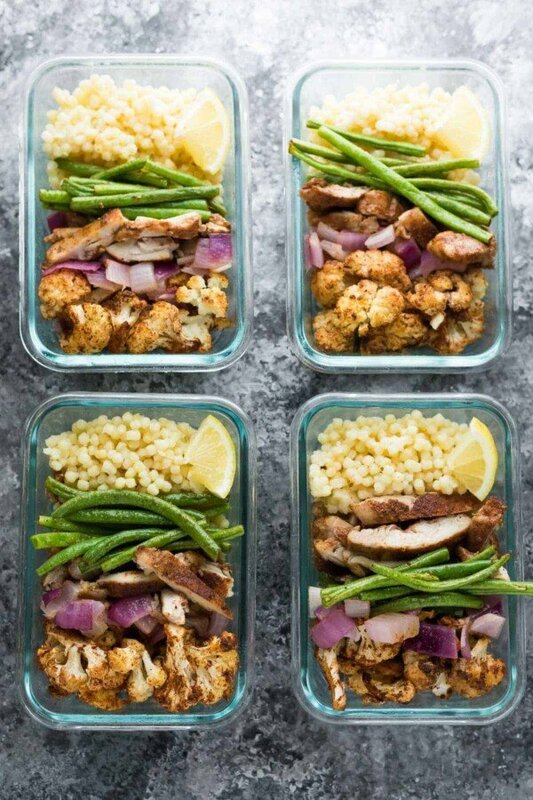 These Moroccan couscous meal prep bowls not only have roasted cauliflower, but also lemony couscous, Moroccan chicken thighs, and green beans. So many tasty things packed into one little meal prep bowl! To go with the roasted cauliflower I finally got to use my pearl couscous that has been eyeing me from the pantry for months now. I love pearl couscous (which is larger than regular couscous)…it has the most amazing and kind of chewy texture. The only downside to pearl couscous is that it doesn’t pack a huge nutritional punch, and has a higher glycemic index…it’s basically the equivalent of pasta. So if you’re looking for more whole grains and healthier, opt for farro, quinoa, bulgur, or brown rice. But for me, I like to mix things up and pearl couscous isn’t something we eat regularly, so I was happy to include it in today’s recipe. Besides, without a sauce or vinaigrette, this recipe is pretty light at only 365 calories per bowl. The first round of this recipe, something was missing and the Moroccan spices felt a little one dimensional. 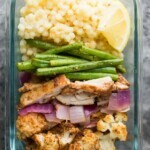 I added some lemon zest and lemon juice to the couscous and I found my answer…the perfect balance of flavors and Ben and I couldn’t get enough of these! Now there is one thing I do need to warn you about with these Moroccan couscous lunch bowls…and that is that the roasted cauliflower won’t smell amazing on day 2, 3 or 4. But I promise promise promise you, it will absolutely taste amazing!! Cook pearl couscous according to package direction, seasoning with ¼ teaspoon salt. Stir in the lemon zest and juice and allow to cool. Arrange chicken thighs on a baking dish and drizzle with olive oil. Season with salt and moroccan seasoning. Turn and repeat with other side. Bake for 20 minutes, flipping once half way, and allow to cool before slicing into strips. 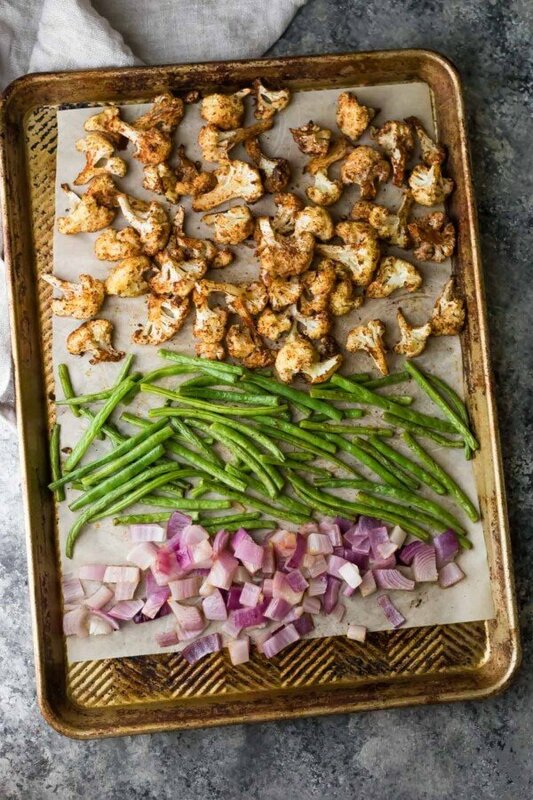 Toss cauliflower florets in olive oil with moroccan seasoning. Arrange on a baking sheet and roast for 15 minutes. Remove from oven, flip, and add green beans and onions (toss quickly in the bowl from the cauliflower to lightly coat in oil & seasoning. Return to oven and cook for another 10 minutes. Allow all ingredients to cool, then portion out into four 2 cup capacity storage containers. Swap pearl couscous for ¾ cup (uncooked) quinoa, brown rice or farro for a whole grain/healthier option. This meal was delicious. I followed the recipe exactly, and did not have any issues with the spices burning. The chicken came out perfectly moist and flavorful! 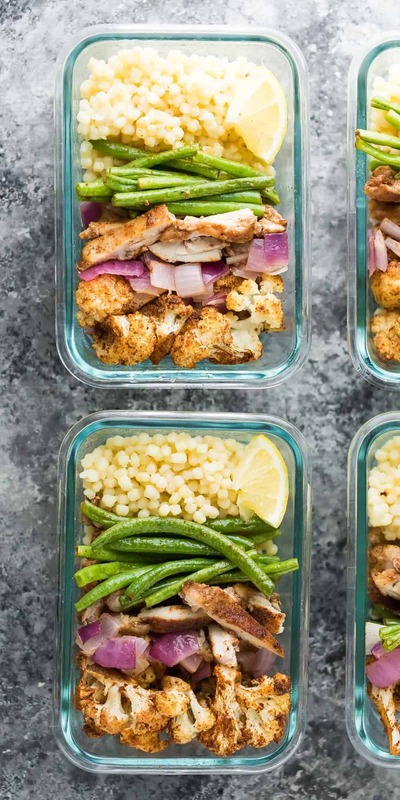 Will definitely be adding this to our meal prep rotation. I’m so happy you didn’t have issues with your spices burning, Serena. Thanks so much for your review! I was using this recipe as a part of my meal prep this week, and once I logged all the ingredients into MyFitnessPal, it came out to more like 768 calories a serving! I went with the lowest calorie option at every turn. Where am I going wrong?!! Hi Lauren, have you double checked each ingredient? Sometimes My Fitness Pal will put in a LOT of calories for something like garlic powder. I can double check when I’m on my other computer for you. Ive noticed the Brown Sugar burn as well. What I did to rid the problem is add a little chicken brother to the bottom and I cooked my veggies on a sheet pan and did my chicken in a bit of chicken broth just to keep some moisture in the bottom which keeps the sugar from burning. Or you can just ad water after about 10 minutes. BTW I LOVE YOUR RECIPES!! That’s interesting! Sounds like I need to retest this spice rub again. Thanks for your input Greg! hi denise this recipe seems great 🙂 i will probably use brown rice instead of couscous but can i also use the indian spice rub instead of the moroccan spice rub for these? I love this recipe, but I have been having issues with the Moroccan rub. I’ve used it for the second time tonight, and by the time the food is done the brown sugar burns. Even just after 10 minutes in the oven my veggies are burnt really bad. Can’t leave the meat in there long enough to cook, the smoke alarm keeps going off…Any helpful tips regarding this, please? Hi Szilvia! I’m sorry, I haven’t had this issue, and I’ve used the rub a lot. What temp are you using the oven at? It looks like the recipe uses raw sugar which has larger crystals. If you’re using regular or dark brown sugar I wouldn’t be surprised if it burns.